Today i tried a new way to steam the bread. It did not perform the way i wanted it to. Kind of a waste of time and money in my opinion. 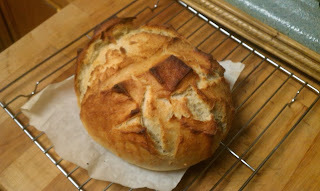 I started off with the basic Boule. I used the basic for one reasone only, its cheap and if i mess up, the birds will be happy. The only slight problem, i added to much sugar to the recipe so it tasted like the breads i dont like. Dont get me wrong, i love Texas Road House rolls that are nice and warm and sugary, but for French bread, its a no go. You can add a we bit of sugar or honey to it but dont add to much. Ok, i am off my soap box. Once i had the basic Boule dough made, i let it rise till double. Once doubled i shapped it and let it proof in either baskets or on a peel. I do slash some of the loafs. It makes a nice pattern and allows the extra gasses to be released, creating a soft and not so dense crumb. 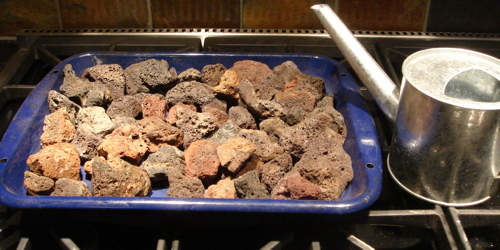 For the steamer, i used a broiler pan with about 20 lava stones in it as mentioned earlier. I pre heat the oven to 450*F. Once pre heated, i place the loaf on top of the stone. I add one cup of hot water to the steamer and bake. The reason i am so upset with this method is because the stones, even after a 45 minute pre heat, dont produce the steam i am looking for. I poured the hot water over them and nothing, no puff, no vapor rising to the ceiling, no nothing. As i have been writting this post, i have done a quick search using a 6 letter search engine to see if there is a better way, apparently there is. One way that i have done it was to use my steam cleaner to inject a bunch of steam for about 15 seconds into the oven. It worked pretty good. Since then i have came up with plans to add a hole in the back of the oven and put a tube from a pressure cooker in there. That way i have continual steam. How will this effect the crust of the bread? Great question. I have no idea. So back to my original point with the internet search. I found, while writting this post that if you use a 10 inch cast iron skillet filled with lava stones, it will produce a killer crust. Well, it looks as if I will have to write another blog post showing my results of this. But back to this current post. You can see from the photos that the finished crust is dark and carmely. It was an awesome crust for about 30 seconds then went super soft and the color went dull. I hope you have enjoyed this post and are willing to try the cast iron lava steamer. Thanks for reading. Enjoy and have fun!